Mods that contain script replacements or new scripts. This is a completely outdated mod that is useless to anyone who doesn't run an old unpatched version of the game. Use LittleMsSam's door locks for a better door lock that works with the current game versions! 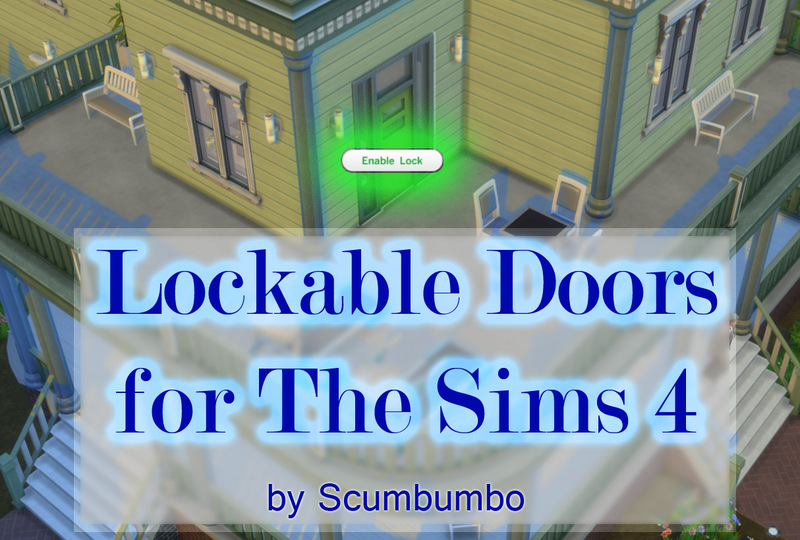 Download LittleMsSam's Unlock/Lock Doors for chosen Sims instead here! Updated to Version 3c - This is a required update for the Door Locks mod to work with the December 4, 2015 game patch or later. This fixes the broken sim picker dialog box which began to occur due to changes in the game's internals. No other changes were made to the mod, so there may be other unknown bugs that have yet to surface - but everything I've tested is working well again. Be sure to remove the old version of the script and package from your mods folder if you upgrade the mod! Remember you must have Script Mods enabled in your game options, even with the new script file format! Door can be set to always allow a list of up to 8 sims to use them. The sim picker dialog will be sorted with currently selected sims first, then the current household, followed by all sims. The list is then sorted by last name and first name. Princemajik has uploaded a mod review on YouTube which discusses how to properly install the mod. 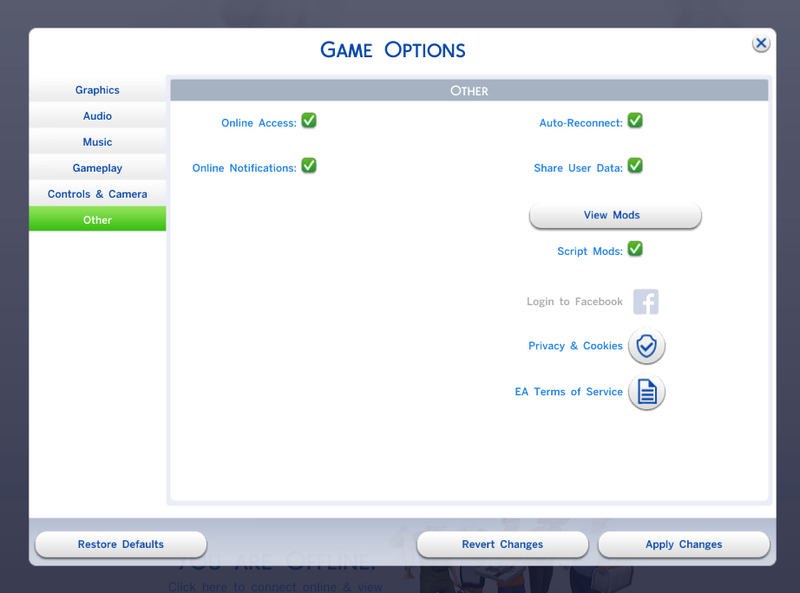 Version 2a contains a bugfix for the age filters which were not working for young adults and older sims. Also several translations have been added (details in credits below). This is pretty well tested, but a LOT of changes were made under the hood so there may be new bugs. There shouldn't be any game breaking bugs, but the old version v1b will continue to be available for a while just in case. Gave the menus a complete overhaul due to all the new options. The internal lock states have changed completely, so any doors you have locked on a lot will be reset to unlocked. 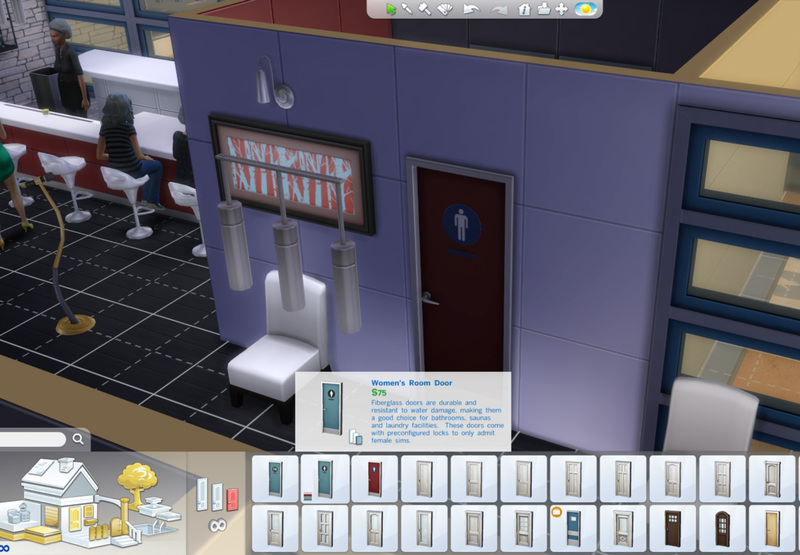 If you downloaded the bathroom doors add-on, any of those doors will automatically translate to the default gender locks for that door. You do not need to download a new version of the bathroom doors. Unfortunately, the menu changes made all existing translations obsolete, so I'll need new ones. Includes the new Spanish translation, the full list of translations is below in the Additional Credits. Removes the lot ownership requirement so that you can set locks on doors at venues or at any visited lot. An add-on is also available which includes recolors of the Featureless Fiberglass Door to provide bathroom doors which are locked by default for the appropriate gender. Custom Content designers can reference the same object tuning instances used by these doors to produce their own doors. To lock a door or gate, just click on it and Enable Lock. To lock an arch, you must target the arch itself, not the blank space in between. 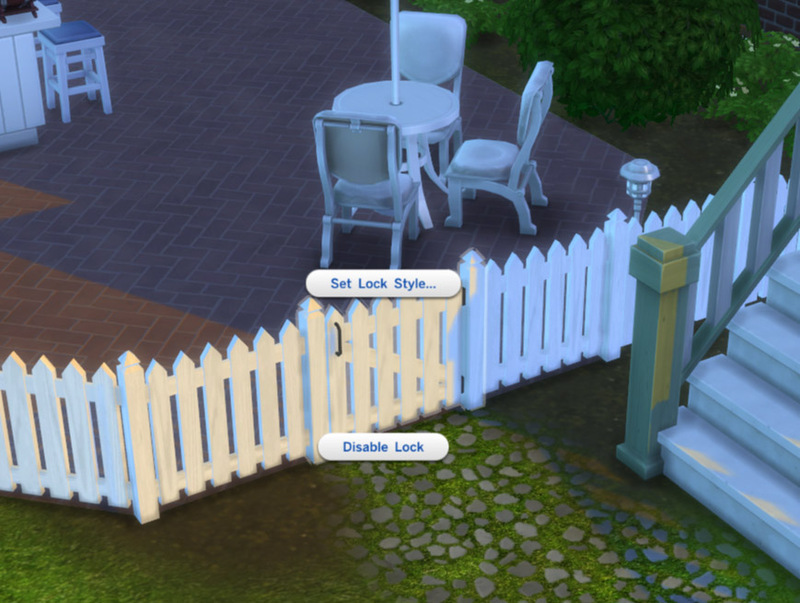 New locks will default to locking the door for all sims. To change the lock style, click on a locked door and select a new lock type. Once a lock type is set, disabling and re-enabling the lock will preserve the lock type you set previously. The lock state for each door is saved with the lot, so when reloading the lot the locks will be set the way you left them. 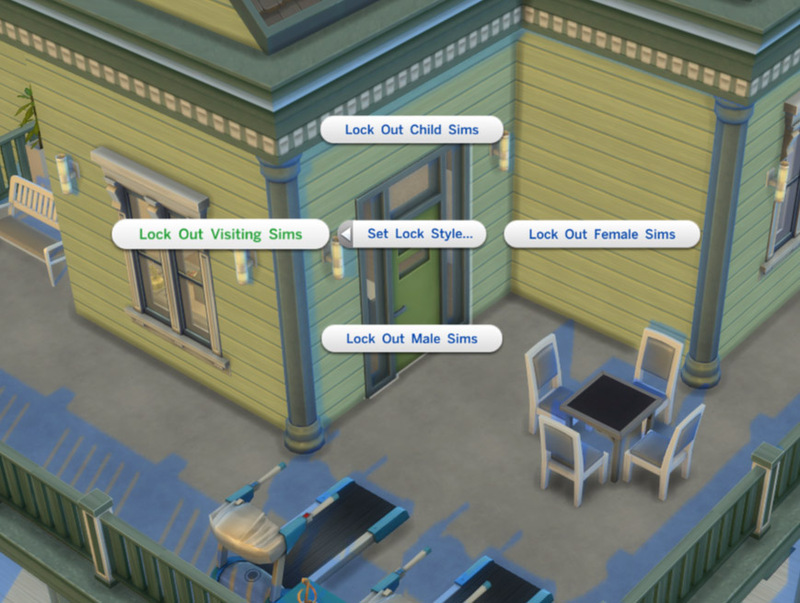 Locks generated by sim roles (maids, ungreeted visitors, etc.) are not affected by the mod. Maids are considered visitors, so a lock can effectively prevent them from snooping around where you don't want them. 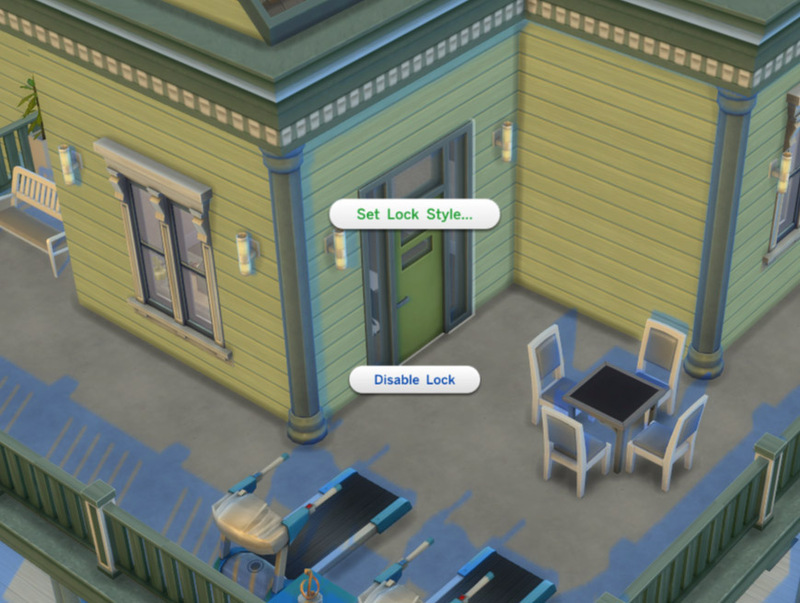 Sims will try their best to route around locked doors. Eventually they will give up and shrug. 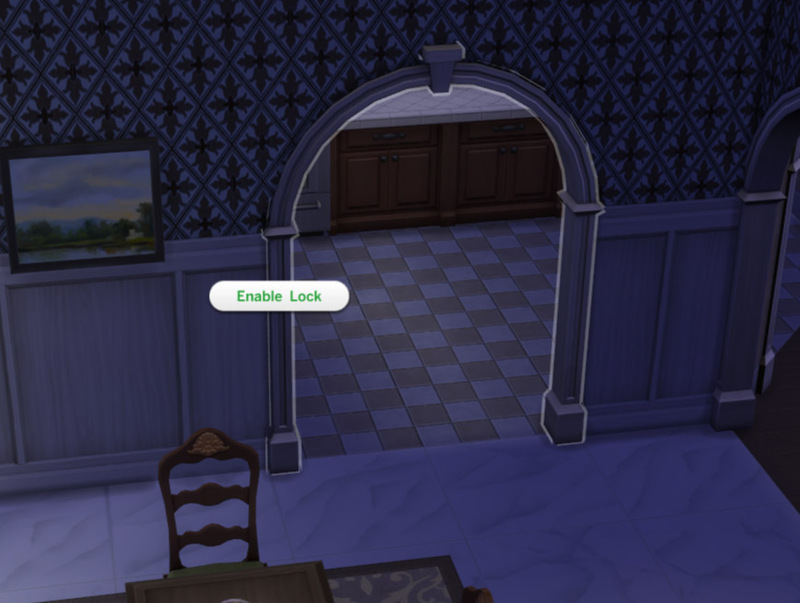 If a sim has already decided on their route to a location, locking a door on their chosen path will be ignored until the next time they try to find a route somewhere. As with any mod, there may be bugs! I ran the mod through some pretty rigourous testing, the final version was tested for at least two hours of locking doors, changing locks, switching lots, saving/reloading, etc. without exiting or restarting the game, so it seems quite stable. At least as stable as the game itself. If you run into serious problems, you can simply remove the mod and the door locks will be silently eliminated from your game when you reload the game. Menu translations are graciously accepted and you will be given credit below. Just send me a string table with the proper translation(s). Starting with version 3b of the mod, the new ts4script file format is used for the script. Installation using the Mod Manager will no longer work until it or one of the other mod management programs is updated. Manual installation is a breeze, just drop the package and ts4script files found in the zip file you download into your mods folder. Script mods must be enabled in your game options for this mod to work properly. The current version of this mod, version 3c, was written and tested on Windows for The Sims 4 version 1.14.49.1020 (January 7, 2016) - the mod should work with the December 4 patch as well. There may be older versions of the mod still available, but these are not supported and may be removed at any time. This modfies the XML tuning for doors, gates and arches and can conflict with any other mods that modify these resources. Custom content doors, gates and arches should work properly with this mod as long as they don't modify the XML, which unless they're doing something unusual should be the case. The mod modifies several of the games scripts in ways that may not be compatible with other mods. The zip file you downloaded should contain a package file and a zip file ending in _Script. Unzip both files into your Mods folder, but do not unzip the zip file ending in _Script -- that should end up in the Mods folder still zipped. The package file can be placed into a subfolder, however the script file must be placed directly in the Mods folder. Princemajik also discusses how to install the mod in his mod review on YouTube. Use only ONE of the mod versions available. The Bathroom Doors are an ADD-ON and requires one of the main Door Lock mods installed.